So, how about that Windows 10? I decided I would go ahead and switch to Windows 10, but before I did I wanted to update my bios just in case. I believe what ended up happening was I updated the bios and all the values went to default - the sata mode went to AHCI. When I booted up, my two 4tb drives are showing as not formatted in My Computer. I can see them both separately and cannot access either one. I switched the sata back to raid but it hasn't changed anything. I was searching and came across testdisk, seems like a handy tool. I've never used it before and just wanted to make sure I am doing the right thing. My motherboard is MSI Z87-G43 GAMING, and I am using it's included raid controller, Intel Rapid Storage Technology. The drives in question are the two 4000 GB ones. But there is also drive D which I am assuming is original raid partition? How should I go about recovering? The data on these drives is not incredibly important, nothing I can't replace. I'd like to try and recover it though if possible. And, why raid 0? Because. lol. I had never set up a raid before and figured if I lost it then no big deal. Can you recreate your RAID0 exactly like before. You shouldn't initialize your RAID0 nor create any partition and format it. 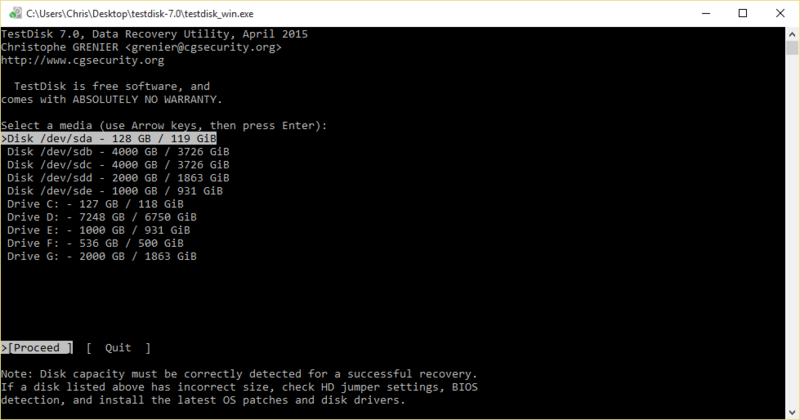 TestDisk can Search for your missed partition and recover them. At least, when your partition would be found and your data are lsited, you can copy them to another healthy disk or partition. I assume that your disk has been a GPT Disk? Fiona wrote: Can you recreate your RAID0 exactly like before. Hello Fiona, thank you for your help!